Flowing 565 miles from its source up in the Cantabrian Mountains all the way to the coast at Illa de Buda, the River Ebro is the longest in Spain. Its journey takes it through dramatic mountain passes, arid plains and the world-famous vineyards of La Rioja, but the final stretch through Catalunya’s lush wetlands is perhaps the most beautiful. Here are just some of the features that make this unique part of Spain such a special place to explore. 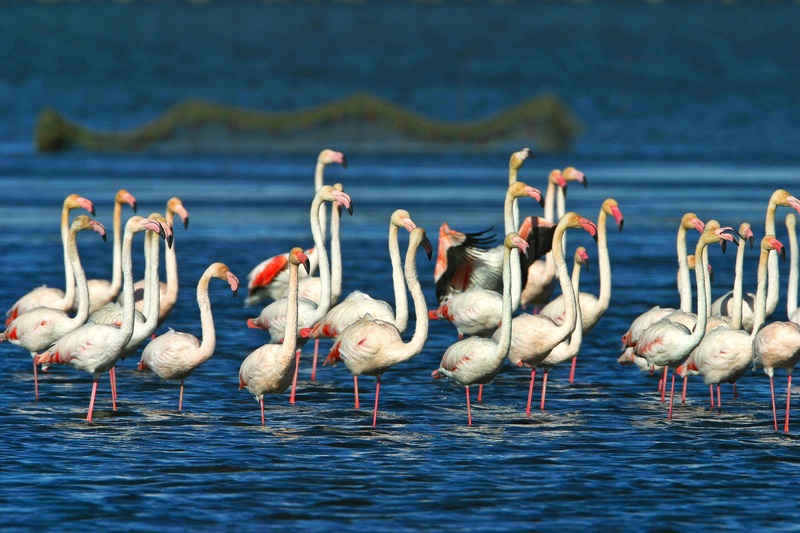 The Ebro Delta’s lagoons, wetlands and saltwater lakes form an unusual habitat of international importance, and have been protected as a nature reserve since 1983. It’s a remarkable landscape to cycle through. Home to over 160 species of bird and even more winter migrants, the area is a paradise for birdwatchers. There’s familiar species such as Herons, Skylarks and Plovers, plus the chance to spot UK rarities including the Bittern and Water Rail. You’ll also be treated to more exotic sights like flocks of Flamingos and stunningly coloured European Bee Eaters. The Delta is home to many other fascinating species and plants too. In the freshwater reserve at Ullals de Baltasar for instance, you’ll find turtles, frogs, newts and beautiful lilies, surrounded by fragrant Eucalyptus trees. Elsewhere you might catch the scent of fragrant sea lavender, or spot the distinctive bobbles of Zygophyllum Album, which grows only here and on a handful of Greek Islands. Keen anglers will be excited to know that the region’s rich waters offer some of the best fishing in Spain. You can take on big predators such as Sea Bass, Blue Fish or Amberjack, or try for Zander and Catfish. The diversity of the Ebro area makes it a haven for humans as well as animals! An active holiday here needn’t be an endurance test – you can easily combine cycling and bird watching with relaxation on beautiful, unspoilt beaches. There’s long, pristine stretches of sand at Illa de Buda, whereas L’Ampolla offers smaller coves and pebbly beaches, and St Carles de la Rapita combines a vibrant town atmosphere with a beachfront and lovely promenade. What better way to cool off after a day exploring than a dip in the crystal-clear waters of the Mediterranean sea? Today Catalunya is part of Spain, but it retains a strong sense of identity. You’ll see and hear Catalan rather than the Castilian Spanish most of us know, and can enjoy wonderful Catalan food. Catalunya thrived in the 12th to 14th centuries, and the rich heritage of its mediaeval golden age can still be experienced in the region’s stunning towns and cities. Tortosa, founded by the Templars 2000 years ago, is an intriguing meeting of Jewish, Christian and Muslim cultures. Walk the ancient Roman walls, admire the Gothic cathedral, and explore the winding streets of the Jewish quarter. There are also fine examples of Spanish Modernista design, such as Joan Torras i Guardiola’s striking Municipal Market. Come to Tortosa in the third week of August and you’ll be swept back in time with the city’s impressive Renaissance Festival, when musicians and performers in elaborate costumes fill the streets. 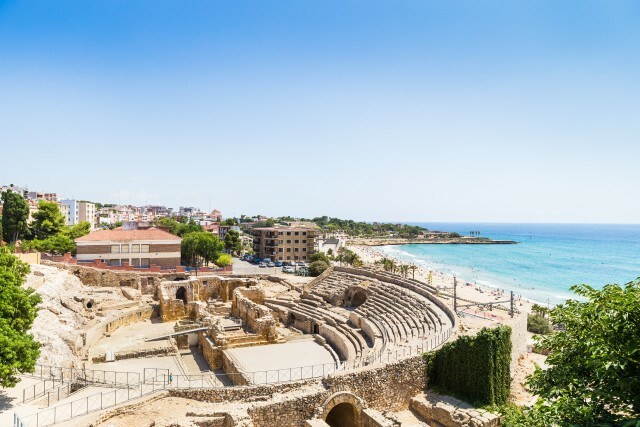 The nearby city of Tarragona is also steeped in history. In Roman times it was one of the grandest cities in Spain, and a treasure trove of ruins remain, including an amphitheatre overlooking the sea and a dramatic aqueduct. You can further explore the past in the excellent Museu Nacional Arquelogic de Tarragona, or wander yet more quaint mediaeval streets. The Historical amphiteather of Tarragona. Like its language, Catalan food is proudly distinct. The region’s mix of Mediterranean coasts, verdant rice fields and rugged farmland make for unusual food combinations you won’t find anywhere else in Spain. Fruit adds richness to meat, fish will often come served with nuts, and classic mar i muntanya (sea and mountain) dishes bring the freshest fish together with hearty meat and spiced Butifara sausages. Sauces are an important part of Catalan cuisine, and usually involve copious amounts of garlic. Nutty Romesco is made from almonds, dried red peppers, garlic and olive oil, Alioli is garlic blended with olive oil, and Samfaina is a ratatouille-like sauce consisting of garlic, onions, tomatoes, peppers and aubergine. Many dishes are also topped with a sprinkle of picada – a mix of nuts, breadcrumbs, parsley and garlic. For a quick snack or starter you can’t beat the ubiquitous Pa Amb Tomaquet – thickly sliced bread rubbed with fresh tomatoes and then generously drizzled with olive oil and salt. Don’t be fooled by this dish’s simplicity – it’s delicious and pure Catalunya. Stews – such as Escudella made of meat, beans, potatoes and cabbage – are also popular. Sometimes this dish is served as a stew, while on other occasions it forms the basis of an entire meal with a soup starter followed by meat and vegetable courses. Esqueixada is an interesting fish salad of Bacalao shredded salt cod, with peppers, tomatoes, onions and red wine vinegar, while Suquet de Peix is a rich tomato-based stew of whatever the local fishermen have caught that day. And for dessert, try Crema Catalina, which is Catalunya’s answer to Crème Brulée, or Mel I Mato – a lovely light dessert made of unsalted goats’ cheese, honey and nuts. Catalunya has a long tradition of winemaking, and is the birthplace of Cava. The sophisticated dry examples are the most prized, and if you fancy a treat you must sample a bottle by Cordoniu, who have been making the finest sparkling wines for over 450 years. Red wines tend to be rich and powerful, with grapes such as Tempranillo, Cabernet Sauvignon and Merlot the most common. Montsant reds are some of the best, balancing punch with refined mineral tones – and of course there’s some excellent Riojas to be had too. Catalan white wines are also big, bursting with tropical fruits and rich oak. The Priorat’s hundred-year-old vineyards produce the majority of the region’s white grapes, which include Garnatxa Blanca Macabeo. With its bird-filled lagoons, ancient towns and unique Catalan culture, the Ebro River Delta will show you a unique and rarely seen side of Spain. With so many quiet trails through the wetlands, rice fields and villages, there’s no better way to explore this special region than on two wheels. 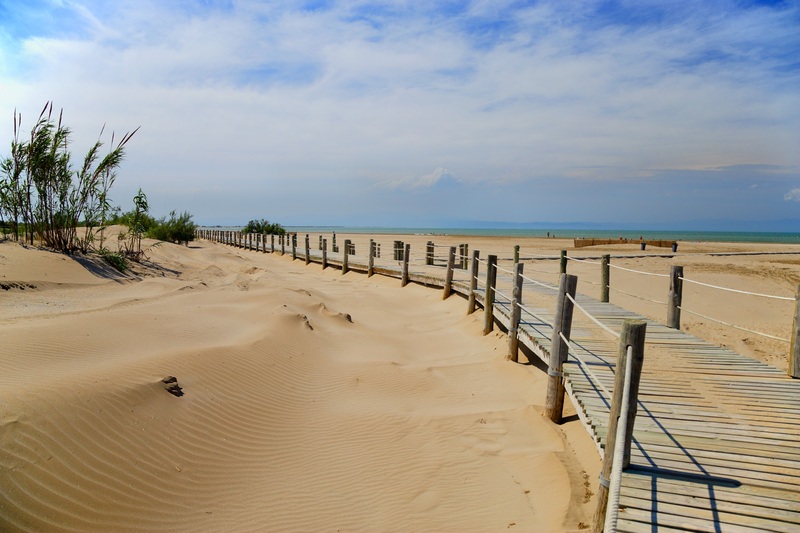 Headwater offers three cycling holidays in the Ebro Delta region: Discovering the Ebro Delta by bike, Cycling around the River Ebro and Undiscovered Southern Catalunya Cycling.